Our Valenspine promotion runs Valentine’s Week. Is constant pain keeping your loved ones from leading a normal, happy life or from accomplishing simple everyday tasks? 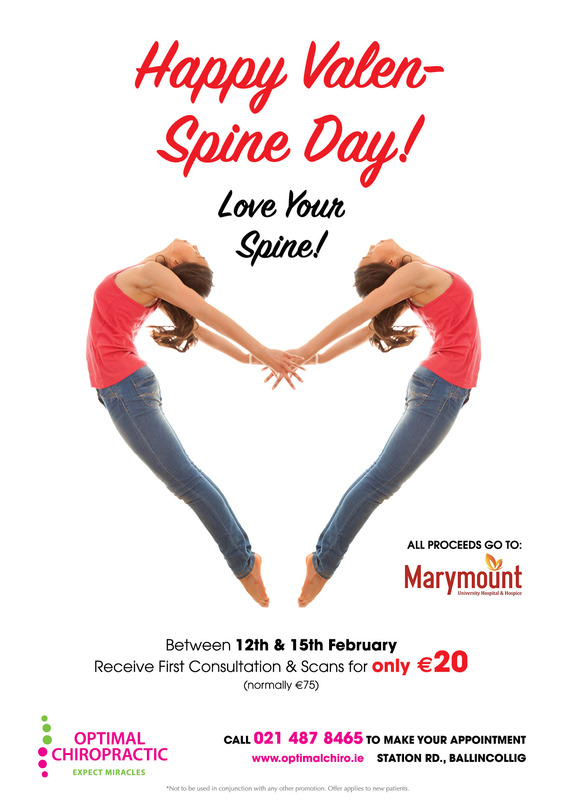 A €20 donation to Marymount will get them a free initial consultation with scans in our office. Between 12th and 15th February 2018 we invite you to have your spine checked (initial consultation and scans) at Optimal Chiropractic in Ballincollig for only €20. All proceeds go to Marymount Hospital and Hospice. Schedule an appointment with us. Call Mary or Marian on 021 487 8465. Chiropractic care can help you get your life back.